Contractor has completed approximately 96% of work on the project. Paving HMA complete with the exception of Stamped gore paving at ramp gores. Completion is expected by October 01. 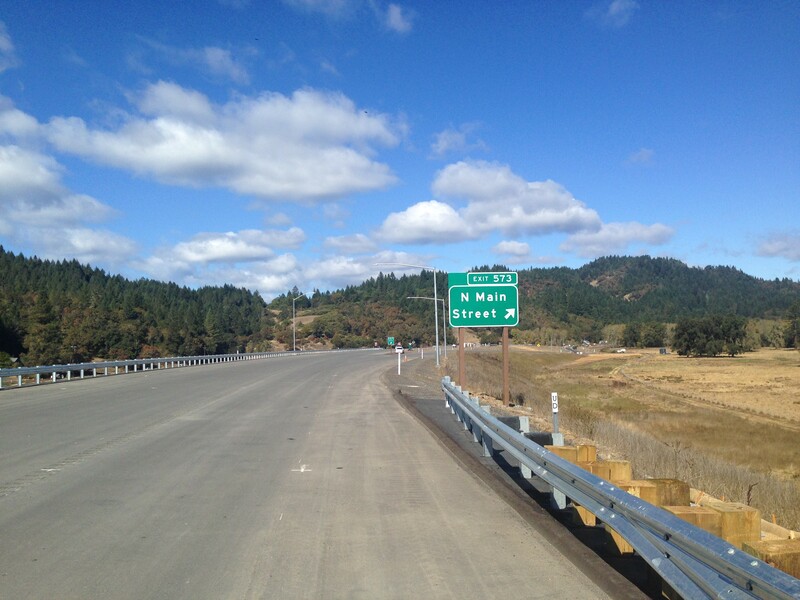 Northbound traffic is currently routed onto the bypass to the new Hwy 20 exit and back to Willits. Traffic will be in this configuration until the bypass opening. Striping and delineation operations are in process. Completion is expected by the middle of October. The Drainage systems are complete and functioning. Electrical facilities for message boards and CCTV cameras are currently being installed. Completion is expected by the middle of October. Street lighting is operational. Roadway signs are currently being installed and anticipated to be completed in early October. Contractor is working on miscellaneous punchlist items and cleanup to complete construction. Completion is anticipated to be complete by the end of October. Drainage systems are complete with the exception of minor punchlist items which will be complete by mid October. Paving up to the northern tie-in is complete. Paving operations are currently underway for the old highway, intersection to the bypass, and the newly constructed cul-de-sac. Completion is expected by the end of September. All signs, striping, and delineation are expected to be completed by mid October. Erosion control is being monitored and maintained at all locations. Street lighting is functional and currently running on Generator power until the PGE drop is completed. The remainder of electrical services is expected to be complete by mid October. The following is a summary of the construction activities that have been completed up to September 20, 2016. Emergency Limited Bid (ELB) Contract. This contract work started on August 11, 2014 and was completed in December 2015. 25 acres of invasive plant removal (Target Weed removal) using mechanical/manual methods. 89 acres of wetland establishment (MGC Plasma North). 3 Locations of headcut repairs (Benbow, Lusher and Frost). Drainage improvement by grading eroded gullies, placed rock still structures and pool structures to slow the flow (rock lined check dams) and stabilized the area with wetland seeds and BMPs. 3 Locations of eroding bank repairs along Outlet Creek. Cut creek bank to widen creek, installed root wad (trunk/root ball) and footer logs for fish habitat along the creek bank, placed RSP to stabilize the creek banks, placed wetland seeds and native grass straw, and planted willows along the creek bank. Access road development for all mitigation parcels/areas. 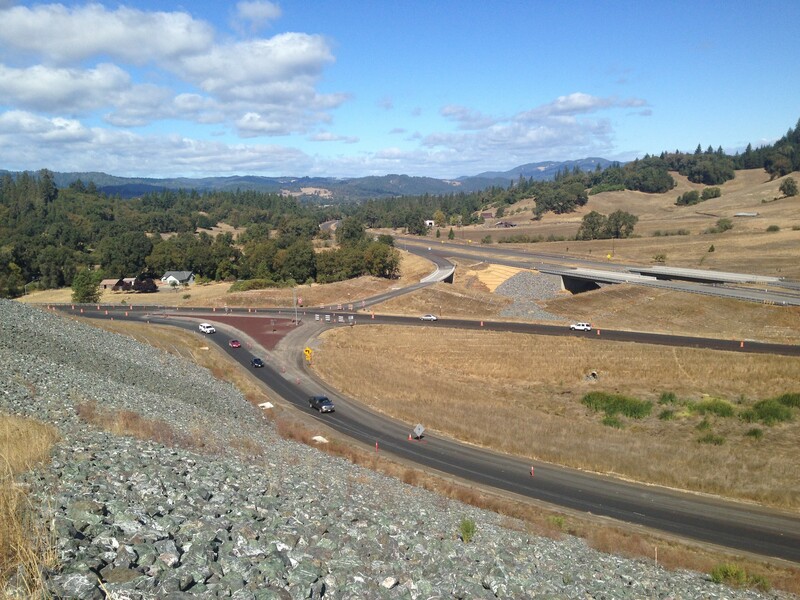 Placed Box culvert at Hearst Willits Road, temporary bridges at Mill Creek/Davis Creek and paved several driveways. Seeds for this project were collected using a separate service contract and provided to the contractor. Mitigation Contract No. 1. This Contract was awarded on April 15, 2015. The first working day was on September 9, 2015. This project includes 3 years of plant establishment. Estimated Completion date is June 2020. 35 acres of wetland establishment (100% completed). Developed stream crossing at 19 locations (100% completed). Harden stream crossing were constructed using 9” cobble stone and 3” clean sand and gravel to access through the creek. 69 acres of invasive plant removal- Target Weed (This will continue until contract acceptance) using mechanical/manual methods. 82 acres of heavy treatment (area preparation for riparian planting, 100% completed). Developed water sources and installed irrigation system for planting and plant establishment work (50% completed). Planted the ELB project areas and Oak woodland areas (54,000 plants installed) and 750 days Plant Establishment started on 01/04/2016 for 2015 planting. Installation of 350,000 plants in wetland creation area (will start in 2016 fall). Installation of 147, 645 plants via Change Order (CO) in mitigation area (will start in 2016 fall). Plants for this projects were propagated using a separate service contract and provide to the contractor. Develop water supply ongoing for the project and include the CO for additional planting. 2015 Plant Establishment and Develop Water Supply are on-going operations. Set up onsite nurseries, flail mowing and pre-watering ahead of planting started on August 29, 2016. 2016 planting started on September 7, 2016. on wetland creation areas. Around 74,000 plants planted to-date. Contractor completed approximately 39%. Time elapsed 24%. Mitigation Contract No. 2. This Contract was awarded on June 30, 2015. The first working day was on September 9, 2015. This project includes 3 years of plant establishment. Estimated Completion date is March 2021. 2 acres of invasive plant removal -target weed removal, Started on July 5th (This will continue until contract acceptance) using mechanical/manual methods. 33 acres of invasive plant removal – heavy treatment started on July 18th (5% completed). 27 acres of Invasive Plant Removal –light treatment, started on June 8th, 2016 (This will continue until contract acceptance). Developing water sources and installing irrigation system for planting and plant establishment work. Plants for this projects will be propagated by the contractor. 45 acres of Invasive Plant Removal – Heavy Treatment 100% completed on August 11, 2016. 45 acres of Ripping 100% completed on August 19, 2016; CO work. 7300 CY of dirt mounds removal 100% completed on August 19, 2016; CO work. 45 acres of Disking started on August 19, 2016; CO work. Completed on September 02, 2016. Contractor completed approximately 28%. Time elapsed 11%. Additional Mitigation Work Completed to Date Includes: In April 20104, a Contract Change Order (CCO) was executed using the Bypass project to implement infrastructure such as 132,000 feet of fencing, 50,000 feet of 2” underground water line, 150 gates, 65 stock tanks, and 25 cattle shades to facilitate cattle grazing activities within the Wetland/Riparian Mitigation project area. 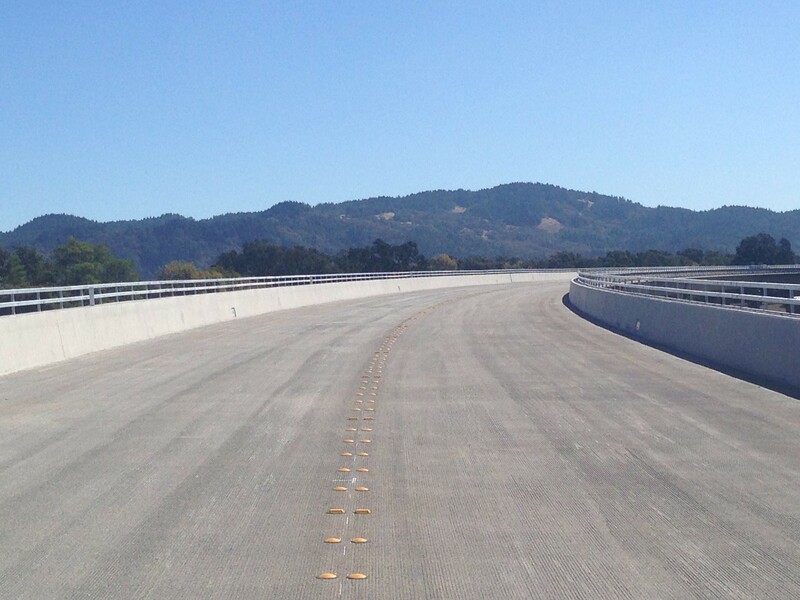 This entry was tagged caltrans, transportation, willits bypass. Bookmark the permalink.